It’s not surprising that we live in an age of liturgical renewal, because the stripped-down minimalism of modernity as expressed in liturgy has created a vacuum into which the superficialities and inanities and, in the case of some liberal churches, downright demons (like Lutheran goddess worship), have rushed. Liturgies are good, bad, or mediocre, but they are not is optional. Conservatives’ liturgical renewal (liberals do have their own version and reasons for it) is designed to re-sacralize life in our deeply secular age. No doubt a liturgical minimalism hasn’t assuaged secularism, but if you’ll examine Charles Taylor’s A Secular Age you’ll see his profoundly argued thesis that it was the retreat from godly “enchantment” as a “lived experience” (the constant awareness of God and his Spirit, as well as demons and Satan, actively at work in the world in all parts of one’s experience) that’s at the root of Western secularization. This retreat is reflected in the move, drenched in Enlightenment prejudices, to adhering to external structural (divine) law without godly “enchantment.” Ironically, the recent Reformed program of a return to a law-based society without the accompanying “lived experience” of godly “enchantment” of (for example) both ancient Israel and the primitive church is actually a capitulation (and contribution) to secularism in the church. Liturgical renewal, while significant, will equally contribute to that secularism, if unaccompanied by the very “lived experience” I mention above. It’s the constant reality of the living God forever surrounding us and constantly at work in the world, and not merely external obedience or superior liturgy, which will combat secularism. 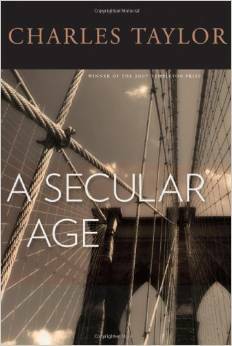 The problem of secularism — and its solution — is much deeper than we sometimes imagine.